White Owl Mango 2 for 99¢ Cigarillos cigars are one of the most popular machine-made cigars in the United States. This box of sixty will delight your senses while being easy on your pocketbook. Natural binders and wrappers enclose the filler and give the cigars a slow and steady burn. The blended tobaccos are from five different countries and have been infused with a wonderful mango flavor. 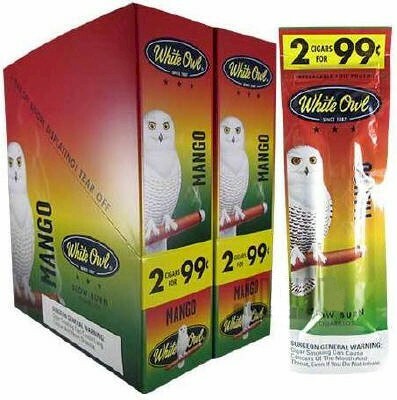 These White Owl Mango 2 for 99¢ Cigarillos come in sets of 30 pouches that contain two cigars each. The pouches ensure that the freshness and flavor of each cigar are well preserved. Available in 30 packs of 2 each.